Although it won’t be like this for too much longer. “If it ain’t broke, don’t fix it,” said the people. But the bureaucrats think otherwise. Dare I ask, what is happening with the main road here? The road has been State Highway One, until the Expressway was opened two years ago. At present it is still owned by NZTA. As part of the revocation as a local road to the Kapiti Coast District Council with an offer of funding to make changes to it, the KCDC invited in the Beca Consultants to come up with plans — which included the inevitable PC cycle lanes on each side of the road, even though you can count the daily number of cyclists on your fingers: to make room for which, plus more car parking spaces, the low stone wall is going (it was put there to stop cars coming too fast from Elizabeth Street (out of sight on the left) from crashing into the shops, which happened once. The shrubbery and the sign in the photo will go. Not only that but even worse the second traffic lane where the photo was taken is going so that cars going north will have to merge from two lanes to one at the intersection — bottleneck. And behind the camera at the next intersection will be another set of traffic lights — in SH1 days there was no need for them, now as a local road there is apparently. 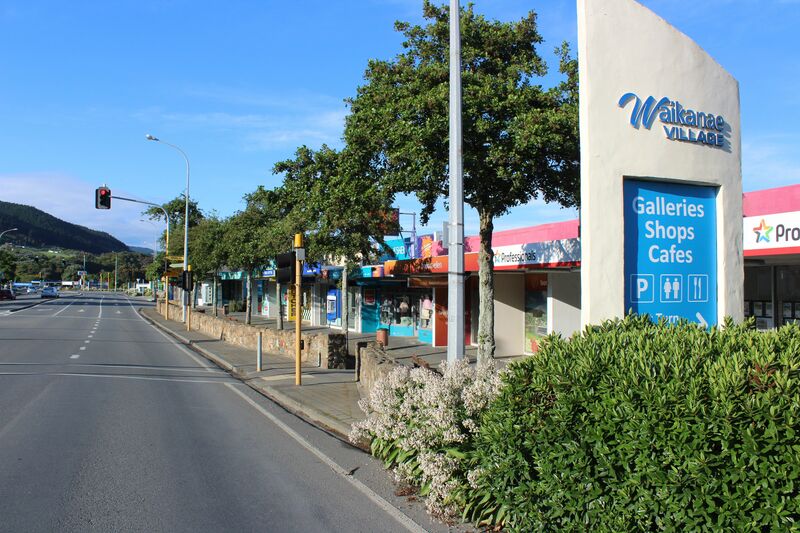 A survey organised by a small local group with backing from the Waikanae Community Board asking about each of the things found that between 55 and 90% of people didn’t want them. But the bureaucrats run the show. Please can someone explain the logic of this to me as no matter how hard I try, I cannot get my head around it! 1. The road was deemed perfectly adequate when it was SH1. This must be so as there was no talk of traffic lights and reduced lanes for safety then! 2. We now have less traffic travelling along the road thanks to the expressway. 3. With less traffic flowing through now, most of which is likely to be local, that in itself would mean that the road has become safer! 4. Traffic lights do not improve traffic flow but merely stop it for a duration and cause frustration for drivers. 5. Has the NZTA forgotten about roundabouts? They deemed it appropriate at Otaihanga, so why not think about it for the Waikanae main road if they insist on doing something! For goodness sake KCDC and NZTA, get a grip and listen to the locals and act on the concerns and leave the main road alone! If you feel you absolutely have to muck around with it to justify your existence, then at least look at roundabouts rather than traffic lights! Oh and as for cyclists, the same applies. They are safer now than they ever were when the road was a main highway. For those that say they avoided the main road for that reason, I say continue to avoid it, simple. Now who is going to explain where I have got it wrong? I am truly open to be enlightened. Lyn, it is impossible to refute your logic. Bureaucracy doesn’t need nor listen to logic. If it did these changes would not be happening. It would help very muchly if the current council guard who don,t know the value of a dollar were got rid of in favour of people who do.